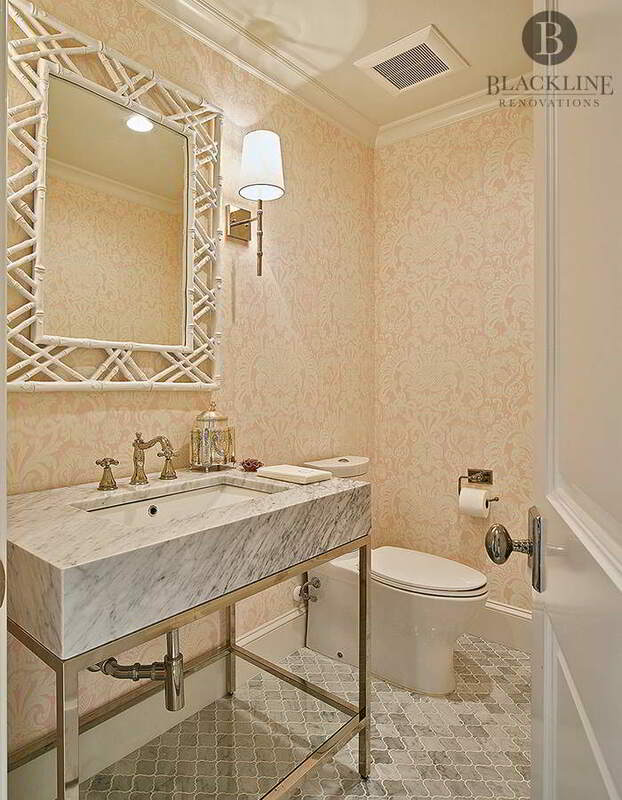 This Preston Hollow bathroom blends a modern Carrara marble and metal vanity with a traditional damask wallpaper in blush pink. Renovating and remodeling historic homes, like those found in the M Streets in Dallas, presents a unique challenge to both clients and contractors- how can you merge both modern and traditional styles to create a home that’s perfect for right now? As we discuss each project with our clients, we focus on three key aspects of the renovation: layout, details, and functionality. Traditional floor plans create a distinction between private and public space with walls and hallways. Modern floor plans create a flow throughout the home that allows for shared spaces, i.e. a kitchen that flows into a living and dining area. We’ll talk through how you will be using your space so you can renovate wisely. Rather than trying to give equal weight to both styles, choose one as the dominant design and then layer in detail from the other. Modern designs favor sleek minimalism- think about the clean lines of the mid-century modern favorite Eames lounge chair. Traditional design styles often come with more elaborate patterns or ornate crown molding. You could add in traditional color palettes or patterns into a crisp, modern dining room through wallpaper or a light fixture. No matter how quaint, if your home’s features don’t fit your lifestyle, you won’t love it for the long-term. Consider who will be living in your home and how you’ll use it. Many growing families are skipping the formal dining room and instead adding seating to a larger kitchen. If you are living in an older home that has defined kitchen and dining areas, you may want to combine the two with your renovation. You might also want to enlarge a powder room to accommodate a shower stall if you have a larger family. Careful and thoughtful planning are important for all home projects, but especially when it comes to updating an older home. We have a lot of experience with older homes, so give us a call if you’re ready to bring your house into the 21stcentury.